According to the PNN, nine universities across the United States, including Harvard, Boston University, Cornell, Stanford, University of Michigan, American University and University of California-Berkeley are publishing these ads in their newspapers. The ads quote a number of Israeli officials, such as Israeli deputy defense minister Rabbi Eli Ben Dahan, who asserted that Palestinians “are beasts, they are not human.” The ads all include a link to a webpage, (www.pal-ad.org/quotes) with additional quotes from Israeli leaders. Palestine Advocacy Project created these ads in order to spark conversation among young Americans on university campuses across the United States. The ads present a side of the Israeli-Palestinian conflict that is seldom featured in the American mainstream media. 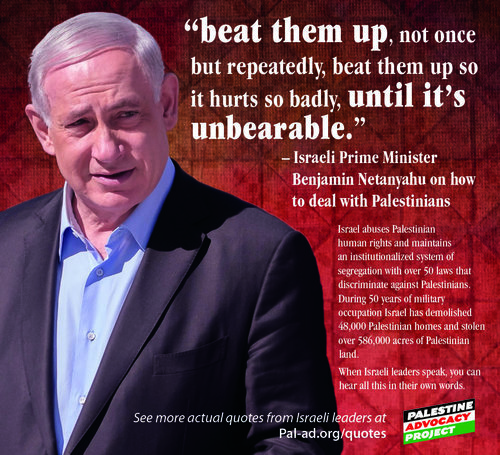 The indisputable, direct quotes from prominent Israeli officials are provocative, and in many cases, explicitly racist. Palestine Advocacy Project has spent the past two years exposing the hypocrisy surrounding the U.S.’s relationship with Israel, and challenging negative stereotypes of Palestinians. The “One Word” campaign, which was released in 2014, showcased the many forms of violence Palestinians are subjected to on a daily basis. More recently, PalAd brought the works of Palestinian Poet Laureate Mahmoud Darwish to public spaces. This latest campaign, which focuses on the violent rhetoric of the upper echelons of Israeli political leadership, will give the American public new information on why the oppression of Palestinians continues. The Palestine Advocacy Project advocates for the rights of Palestine and Palestinians by educating on the human rights issues impacting Palestine. The Palestine Advocacy Project seeks individuals support to volunteer or donate to help us advocate for Palestinians. The Palestine Advocacy Project appreciates any support you can offer. Copyright © 2018. Palestine Advocacy Group.